Both Babylonia and Assyria were under increased Aramaean pressure and having great difficulties repulsing the persistent Aramaean attacks in the early 1st millennium BC. At the same time when Assyria reached its height Babylonia was either under direct or indirect Assyrian control and could not achieve any greater significance before the collapse of Neo-Assyrian Empire in 626 BC. Under Ashurdan II (934-912 BC) the Assyrians managed to overtake the initiative, suppressed the Aramaeans and stabilized the Assyrian borders, while his successor further strengthened the Assyrian kingdom and extended its borders. Territorial extent of Assyria under Ashurnasirpal II (883-859 BC) was comparable with the one under Tiglath-Pileser I. Ashurnasirpal II is best know for his military achievements and for great building activities including for building of the new Assyrian capital at Kalhu or Nimrud (Kalakh in the Old Testament) as well as for his brutality against his enemies. He was succeeded by his son Shalmaneser III (858-824 BC) who even enlarged the territory he inherited from his father. Shalmaneser III conquered northern Syria, forced King Jehu of Israel to pay tribute and for a short time also subdued Cilicia. On the east he led campaigns to today’s western Iran but as one of his most important achievements he considered his conquest of Babylonia. Like his father, Shalmaneser III was also renowned for his building activities, while the best known work from his time is probably the Black Obelisk (today in British Museum) which depicts King Jehu of Israel paying tribute. At the end of his rule Shalmaneser III was faced with rebellion of his son Shamsi-Adad V (husband of the legendary Shammuramat) who succeeded him after his death in 824 BC. Shamsi-Adad III was forced to fight against the Babylonians although his wife was a Babylonian. He campaigned with varying success but at the end he managed to defeat Babylonia although latter retained its independence. After his premature death his wife Sammuramat (Semiramis) took over the regency and allegedly ruled very successful. However, she is more a mythical figure and little is known about her from historical sources. Assyrian power was greatly weakened after the death of Adadnirari III in 783 BC until the accession of Tiglath-Pileser III in 745 BC. 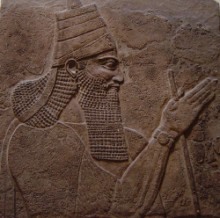 Tiglath-Pileser III (745-727 BC) was one of the greatest rulers of Assyria and brought the empire to its greatest extent, while the year of his accession to the Assyrian throne is commonly marked as the beginning of Neo-Assyrian Empire. After he settled the internal disorders Tiglath-Pileser III launched a campaign against the Aramaeans in Babylonia. In several expeditions he conquered the Aramaean kingdoms in north Syria and defeated Urartu. Afterwards he invaded southern Syria and Palestine, and severely defeated Israel. In 731 BC he turned against Babylonia where the Aramaean Ukin-zer crowned himself king. The Aramaean king of Babylonia was captured and deposed in 729 BC, while Tiglath-Pileser III became the first Assyrian king of Babylonia under the name Pulu (Pul in the Old Testament). Following short and relatively unimportant rein of his son Shalmaneser V (726-722BC) the crown of Assyria was assumed by Sharru-kin widely known as Sargon II (721-705BC) who was one of the greatest rulers of Assyrian Empire. The change on the Assyrian throne was taken advantage by Aramaeans in Babylonia and the Aramaean prince Marduk-apla-iddina II was able to seize power in Babylon. Sargon II first tried to regain control over Babylon but the Aramaean king managed to retain himself until 710 BC when Sargon finally managed to crush the Aramaeans and crowned himself king of Babylonia. Like his predecessors, Sargon II continued successful military campaigns on the east and conquered Israel including its capital Samaria, defeated the Egyptians, destroyed Urartu and forced Phrygia and Cilicia to pay tribute. Sargon died on a military campaign in 705 BC and was succeeded by his son Sennacherib (704-681 BC) who transferred Assyrian capital to city of Niniveh. Sennacherib’s reign was marked by struggles with Elam as well as by difficulties with Babylonia. Marduk-apla-iddina crowned himself king of Babylon with the support of Elam for the second time in 703 BC. Sennacherib managed to defeat the allied forces of Babylonians, Elamites and Aramaeans one year later and installed a puppet king in Babylonia. Sennacherib is probably best known for his campaign against Syria and Palestine and siege of Jerusalem which according to the Old Testament failed because of an outbreak of epidemic which decimated Sennacherib’s forces and forced him to leave Palestine. At the end of his rule the power of Assyria began to decline and civil war broke out after Sennacherib’s murder in 681 BC. Esarhaddon, the youngest son of Sennarcherib won the civil war and assumed power in the same year of his father’s death. Immediately after his accession to the throne Esarhaddon settled the internal disturbances and shortly afterwards rebuilt the city of Babylon which was destroyed by his father Sennercharib. Esathaddon was successful against the Aramaeans and Cimmerians and led successful campaigns against the land of Bazu (northeastern Arabic Peninsula), Syria and Palestine. In 671 BC he conquered Memphis and proclaimed himself king of Egypt but as soon as his forces left the Egyptians rebelled against Assyrian overrule. Esathaddon assured succession to his third son Ashurbanipal, while his second born son Shamash-shum-ukin was crown prince of Babylonia (the eldest son died early). Thus both Esathaddon’s sons succeeded him after his death in 668 BC: Ashurbanipal (668-627 BC) succeeded him as king of Assyria and Shamash-shum-kin (668-648 BC) took the throne of Babylonia. 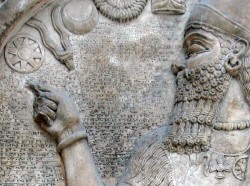 Ashurbanipal was the last great king of Assyria. Shortly after his accession to the throne he put down the rebellion in Egypt and ruled Egypt until 655 BC when Egyptians renewed their independence. Ashurbanipal was at the time occupied with Elamites who were invading Babylonia. He managed to defeat the Elamites in 653 BC but his brother Shamash-shum-kin formed a secret alliance directed against Ashurbanipal with Elamites, Aramaeans, Iranians and Egyptians. Shamash-shum-kin launched an attack shortly after Ashurbanipal decisively defeated the Elamites who were no longer in state to contribute to the secret alliance. After a three-year- long siege Ashurbanipal defeated his brother who died in his burning palace in city of Babylon. When he crushed the Babylonian upheaval Ashurbanipal launched several campaigns against the Arabs who supported Babylonia against him but is main goal was conquest of Elam. He invaded Elam in 646 BC, captured and ruined Susa and made Elam an Assyrian province. Despite his successful military campaigns Ashurbanipal is probably better known for establishing the first systematically organized library at Nineveh - the Library of Ashurbanipal. After Ashurbanipal’s death in 626 BC the power of Assyrian Empire began to decline. He was succeeded by his son Ashur-etel-ilani (625-621 BC) but his brother Sin-shar-ishkin (620-612) refuse to recognize him and rebelled. The Neo-Assyrian Empire, weakened by internal struggles perhaps also by a civil war finally collapsed in 612 BC when the Medes and Babylonians captured the Assyrian capital city of Nineveh. 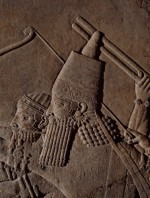 The last Assyrian king was Ashur-uballit II (612-609 BC) but with the fall of Nineveh in 612 BC Assyria came to an end.